What does this mean to you to have Scolio-Pilates at a children’s hospital? Are you an instructor? Pilates has just taken a big step forward towards medical acceptance. Are you someone living with scoliosis? Now you have a precendence for an entire team working together to care for your scoliosis. The gap that exists in communication between your medical doctor, your physical therapist and your Pilates Instructor is closing. 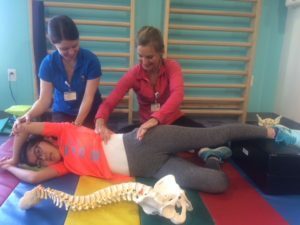 While scoliosis is traditionally managed through observation, bracing and surgery, Dayton Children’s Hospital has taken a ground-breaking step to include Scolio-Pilates, a 3-dimensional exercise program for scoliosis, to their list of management tools for their patients. It’s ground-breaking for a hospital, for Pilates Instructors and most importantly, ground-breaking for you if you as you try to manage your own.scoliosis. Thank you. To you all. Your belief in the Scolio-Pilates work remains the essential item that makes Scolio-Pilates, in any form, a reality. At Dayton Children’s, a new platform for Scolio-Pilates is offered: a children’s hospital with a collaborative effort between the entire medical team to support each scoliosis patient. Medical doctors, orthotists and physical therapists all working and communicating with one another towards a common goal: a healthier scoliosis patient. Karena with Karen Kleiner. Karen had the vision to bring ScolioPilates to Dayton Chlidren’s Hospital. 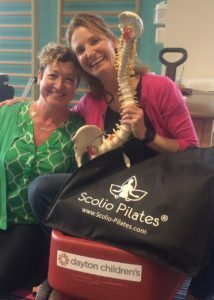 Thank you, Karen, for bringing ScolioPilates to children with scoliosis! How did Scolio-Pilates end up at Dayton Children’s? We (me, along with Logistics-John) taught a Scolio-Pilates Introductory course in Naples, Florida a little less than a year ago. One of the students in the course, Karen Kleiner, along with her husband Larry Kleiner, M.D. , believed so much in the work that they decided that Scolio-Pilates had to be at their children’s hospital. They sent emails, scheduled meetings and things rapidly fell into place. Karen Kleiner had the vision of making it happen, but the team at Dayton Children’s—from Ann Smith, director of physical therapy, to Ben Goodstein, Vice President, to the entire team of orthopedic surgeons, stood behind the Scolio-Pilates program, making it a reality. I spent the better part of this past summer working to train the therapists at Dayton Children’s in the Scolio-Pilates work. Their commitment to understanding the work continues. We work together still via live video calls and Dayton Children’s is sending 3 therapists here, to California, to continue their training with me this coming Spring. I don’t know exactly where Scolio-Pilates will go next. Every year, I look back at the previous year and I am surprised by how much the work has grown, how much interest and how much need there is for a program that assists in the management of scoliosis. I would love to see everyone with scoliosis have the opportunity to perform this 3-dimensional program for their own spines. But there’s a lot of work between where we are now and making that a reality. It’s one trained Pilates Instructor and physical therapist at a time. But our numbers are growing and who knows where you will encourage us to take Scolio-Pilates next. Thank you for being with us through it all.